Kelantan 1911 3c Red. SG2. Fine used 1911 3c Red. SG2. Kelantan 1921 1c Black. SG15. Used 1921 1c Black. SG15. Kelantan 1921 4c Black and red. SG17. Fine used 1921 4c Black and red. SG17. 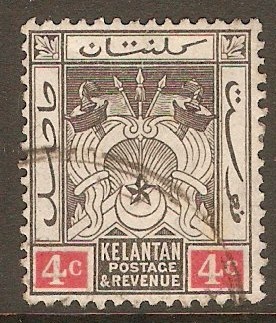 Kelantan 1922 4c. Black and Red. SG30. Mounted Mint 1922 4c. Black and Red. SG30. Stamp overprinted with "MALAYA BORNEO EXHIBITION". Stamp has some toning around perforations. 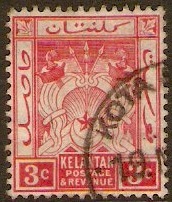 Kelantan 1922 5c. Green and Red on Pale Yellow Paper. SG31. Mounted Mint 1922 5c. Green and Red on Pale Yellow Paper. SG31. Stamp overprinted with "MALAYA BORNEO EXHIBITION". Kelantan 1922 30c. Dull Purple and Red. SG32. Mounted Mint 1922 30c. Dull Purple and Red. SG32. 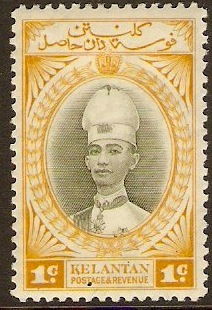 Stamp overprinted with "MALAYA BORNEO EXHIBITION". Stamp has some toning around perforations. Kelantan 1922 $2. Green and Carmine. SG35. Mounted Mint 1922 $2. Green and Carmine. SG35. 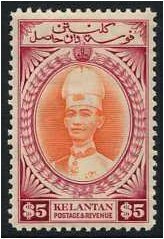 Stamp overprinted with "MALAYA BORNEO EXHIBITION". Kelantan 1922 1c Green. SG37. Mounted Mint 1922 1c Green. SG37. Stamp overprinted with "MALAYA BORNEO EXHIBITION". Stamp has some toning around perforations. 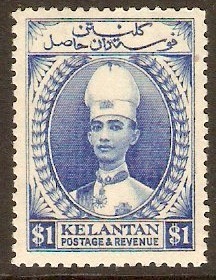 Kelantan 1928 $1 Blue. SG39. Mounted mint 1928 $1 Blue. SG39. 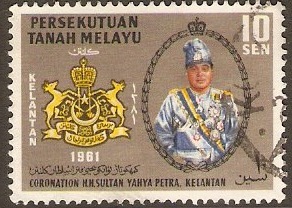 Sultan Ismail definitive stamp. 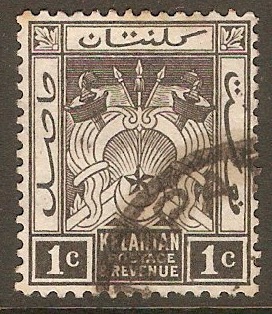 Kelantan 1937 1c Grey-olive and yellow. SG40. Mounted mint 1937 1c Grey-olive and yellow. SG40. Sultan Ismail series.